Enhanced Abilities: Cyborg Superman’s body is a cybernetic/kryptonian hybrid and which provides him with super human strength, speed agility, durability and endurance. Flight: Cyborg Superman’s unique kryptonian/cybernetic body allows him to fly. Body Armour: Cyborg Superman’s unique hybrid physiology provides him with a high degree of protection against physical and energy attacks. Technopathy: Cyborg Superman’s consciousness survives in an electronic state, he is able to 'inhabit' any machine or technology and manipulate said devices as though they are living metal. Among other abilities, he can animate machines, construct any technological device, control any mechanical system and change the shape of the mechanical components of his 'bodies'. At his core he is an energy being and is extremely difficult to permanently destroy, as he can transfer his electronic consciousness into any nearby machine. 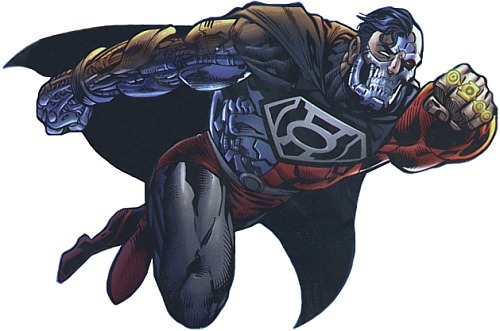 Enhanced Senses: Cyborg Superman has enhanced senses, x-ray, and infrared vision, and ultrasonic hearing. Heat Vision: Cyborg Superman has heat/laser vision. Hank Henshaw was a crewmember onboard the doomed LexCorp space shuttle Excalibur. Henshaw and the other three members of the Excalibur crew, including his wife, Terri, were exposed to cosmic radiation, causing their shuttle to crash. As a result of their radiation exposure, the human bodies of two crewmembers were destroyed. However, their minds survived and they were able to construct new bodies out of "cosmic radiation" along with pieces of earth and wreckage from the shuttle. Initially, Henshaw and his wife suffered no ill effects from the radiation, and the crew travelled to Metropolis in the hope of using LexCorp facilities to cure their mutated crewmates. During a brief battle with Superman, the crewmember now composed of radiation became unhinged and flew into the sun, while the other crewmember committed suicide using an MRI booth. By this time, Henshaw's body began to rapidly decay while his wife began to phase into an alternate dimension. With Superman's help, Henshaw was able to use the LexCorp facilities to save Terri, but died immediately afterwards. Though Hank Henshaw's physical body expired, he was able to transfer his consciousness into the LexCorp mainframe. Now able to control technology, Henshaw appeared to his wife in a robotic body; the shock of this bizarre rebirth was too much for Terri and she committed suicide by jumping from her hospital window. By this point, Henshaw's electronic consciousness had begun to disrupt Earth's communications networks. Using NASA communications equipment, Henshaw beamed his mind into the 'birthing matrix', which had carried Superman from Krypton to Earth as an infant. He crafted a small exploration craft from the birthing matrix and departed into outer space alone. Henshaw then spent some time travelling between galaxies, bonding with local life forms to learn about the culture and history of various worlds. Over time, Henshaw became delusional and paranoid, believing that Superman had caused the deaths of himself and his wife, and had then driven him from the Earth. Arriving on a planet controlled by alien overlord Mongul, who’s hatred of Superman matched his own. Together Mongul and Henshaw depart for Earth with a plan for revenge against Superman.